Recognized as the industry standard for more than 60 years...and still going strong. All weights are within +/- 3 grams. Other testers tolerances are up to 10x more! For over 60 years the SUTHERLAND® 2000™ Rub Tester has been recognized as the industries standard for testing abrasion resistance. 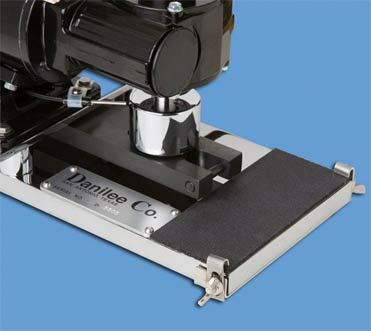 Today, the SUTHERLAND® 2000™ Rub Tester now offers 4 speeds, allowing the customer even greater flexibility and the Danilee brand has an established reputation for providing an exceptionally qualified rub testing product. 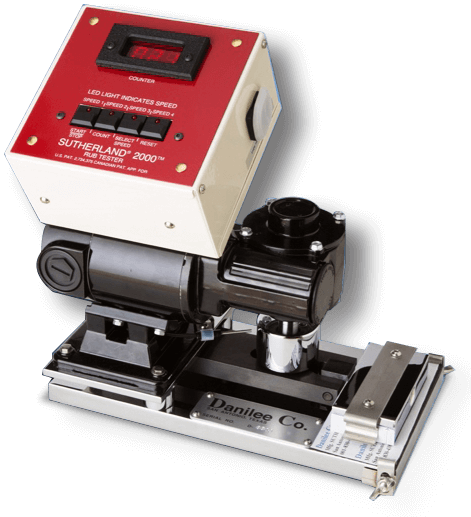 The SUTHERLAND® 2000™ Rub Tester is a motor-driven abrasion testing instrument for moving a weighted test strip over a printed specimen through an arc. The tester motor has four speeds: The first speed is 21 cycles per minute (half the speed of the older models) which will make the "wet" tests and tests using under 5 strokes easier to perform. The second speed is 42 cycles per minute, the third speed is 85 cycles per minute (the same as the older models), and the fourth speed is faster at 106 cycles per minute. The exceptional design of the tester enables abrasion testing procedure customization options for a customer's product while maintaining the ability to reproduce a procedure completed by an older model unit.